Col. Jovito Palparan, alleged mastermind of the abduction and summary execution of two prominent Southern Tagalog leaders, will take the hot seat as two committees in the House and Senate begin their investigation into the case on May 5 and 6. Militant groups, who earlier paid tribute to the two slain leaders before their burial, deplored the transfer of Palparan from Oriental Mindoro to Tanay, Rizal. The April 21 abduction and summary execution of a human rights advocate and a peasant leader in Oriental Mindoro will be the subject of a congressional inquiry set for May 5 and 6. The House committee on justice and human rights will hold a hearing on the case on May 5 with its counterpart in the Senate headed by Sen. Francis Pangilinan conducting a similar investigation the following day. The House probe came a week after Bayan Muna Reps. Satur Ocampo and Crispin Beltran delivered separate privilege speeches denouncing the killing of Eden Marcellana, secretary-general of the human rights alliance Karapatan in Southern Tagalog and Eddie Gumanoy, chair of Kasama-TK, a peasant alliance. Both congressmen threw the blame squarely on President Gloria Macapagal-Arroyo who, reports said, had recommended the promotion to brigadier general of Col. Jovito Palparan, commander of the Army’s 204th Infantry Brigade in Oriental Mindoro. Palparan has been suspected as the mastermind of the killings of Marcellana and Gumanoy and of several others since April 2001. Marcellana and Gumanoy were abducted at gunpoint by 20 masked men in Naujan, Oriental Mindoro and their bodies were found the following day. Post-mortem examination by doctors from the government Commission on Human Rights revealed the two were hogtied and probably tortured before they were killed. Their bodies bore stab and gunshot wounds. Nine companions of the two leaders who were also abducted survived the ordeal. A newspaper cited a highly-placed source in the justice department as saying the military was behind the abduction and brutal killing of Marcellana and Gumanoy. Asked whether Palparan and his men killed the two Southern Tagalog leaders, the source said: "It is possible." 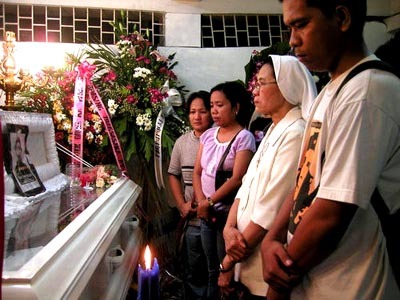 Justice Undersecretary Jose Calida, head of the five-man task force investigating the Naujan incident, refused to blame the deaths on Palparan, even as he ruled out the involvement of vigilante groups. Calida said vigilante groups don't usually hide their identities. Palparan, meanwhile, has been relieved of his post and transferred to the headquarters of 2nd Infantry Division chief, Maj. Gen. Efren Abu, in Tanay, Rizal which is under the Southern Luzon Command. Armed Forces chief Gen. Narciso Abaya said the colonel’s pullout is a standard procedure for any military official under investigation. Replacing Palparan was Col. Juanito Gomez, deputy commander of the 204th IB. Karapatan-Rizal also condemned Palparan’s deployment to Rizal. “Pinapangambahan naming tataas pa ang bilang ng paglabag sa karapatang pantao kagaya ng nangyari sa Mindoro sa ilalim ng pamumuno ng berdugong si Palparan”(We fear human rights abuses will intensify as in Mindoro under Palparan) , said Rev. Armano Perez, Karapatan provincial chairperson. Karapatan-Rizal has documented 76 cases of military abuses in the province. Gumanoy’s own son, 14-year-old Daniel, has only anger for Palparan’s transfer. "He should be punished. They should jail him," he said at the funeral march for his father. “It is stupid and ludicrous if the Arroyo government thinks that the mere pull-out of Palparan in Mindoro would compensate for his more than a decade-long campaign against unarmed civilians. This merely shows the government’s condoning of crimes perpetrated the military,” Lacandazo said. Lacandazo said Palparan should have been relieved a long time ago since the abuses in the Southern Tagalog region escalated after the colonel was assigned to Mindoro. Twenty-seven others have been killed since two years ago when Palparan and his alleged death squad first sowed death and terror in the province, she said. Leaders of Bayan have called on the task force to investigate all 29 killings in Mindoro Oriental by suspected elements of the 204th IB under Palparan. Gobrin also holds Palparan accountable for the displacement of more than 1,500 Mangyans and Mindoro residents at the height of the all-out-war operations waged by the military in 2001.